Shop the Cave and Save! 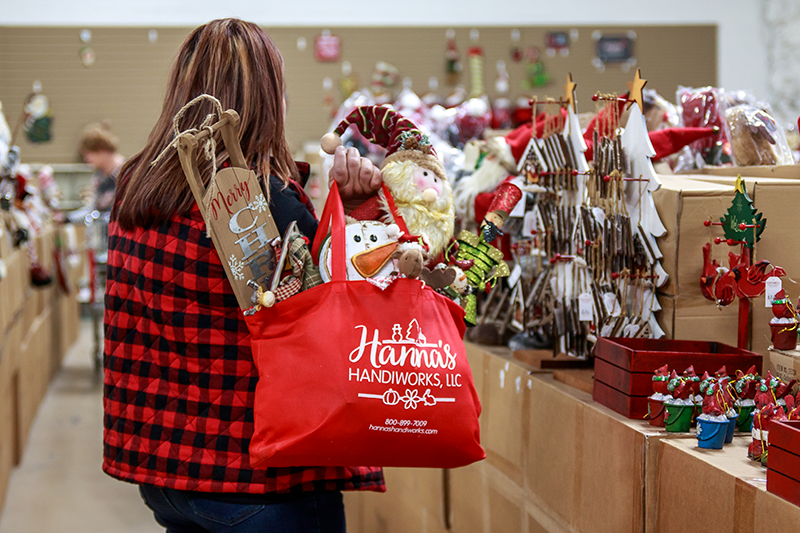 Like many wholesale companies, Hanna’s Handiworks operates a Sample Store which is open to both our wholesale customers and the public. Our 4000-square-foot store is located within our Lee’s Summit, MO cave-complex location, adjacent to our home office and warehouse. Items in our Sample Store are overstock, close-out merchandise or open cases, and generally priced below our already low, wholesale prices. In addition, we frequently run in-store specials, giveaways and promotions. There are no minimum purchase requirements or opening order amounts, and you may buy individual pieces or in complete assortments as available. Please note: Because the inventory in our Sample Store is maintained separately from our main wholesale inventory, Sample Store merchandise cannot be ordered or shipped. While our Sample Store is most heavily trafficked with holiday shoppers from September through December, you’ll find we are open year-round excluding the first three weeks in January, select holidays and seasonal weekends. Never the same shopping experience twice, our Sample Store features a constant rotation of seasonal, gift, holiday and everyday home decor. If you live in the Greater Kansas City area or are planning to visit, we invite you to stop by the cave and take advantage of the many great deals Hanna’s Sample Store has to offer! Limited Saturday hours return April 2019. Please join us on Facebook for updates. 2019 Saturdays: Call (816) 373-3900 for Sample Store weekend availability, and follow our Sample Store page on Facebook for our most current updates and announcements.